With clients like Michael Phelps, Felix Hernandez, Piers Morgan, and The Grammy Awards, the Octagon Agency always has something interesting going on inside its flagship office near Washington, DC. The company — a division of the international media and advertising conglomerate Interpublic Group — develops and manages sports entertainment, and event marketing and advertising. So when they commissioned NY-based TPG Architecture to update and redesign their 125-employee office in McLean, Virg., they wanted a timeless, contemporary interior that reflected the excitement and dynamic nature of their clientele. “TPG Architecture has had an ongoing and positive relationship with many of the other agencies in the Interpublic network, and they understand how to balance style with function,” said Phil de Picciotto, founder and president of Octagon Agency. Branded Wall at Octagon Agency in McLean, Virg. Pantry view of “Octapen” at Octagon Agency in McLean, Virg. Client Wall at Octagon Agency in McLean, Virg. Reception and collaboration hub at Octagon Agency in McLean, Virg. The company leases 25,000 square-feet in a building owned and mostly occupied by Gannett Media. TKP designed the unusual building in the 70’s; it has a narrow, elbow-shaped footprint that allows for many window offices but also has an awkward floorplate at several points. Floor plan at Octagon Agency in McLean, Virg. TPG’s design team developed several strong interventions to a traditional layout with private offices along corridors and window walls, focusing design efforts at the entrance sequence and around the company’s conference rooms. They also paid special attention to the “Octapen,” an open, public space on the south wall that includes a pantry, lunch and eating areas, a pool table, video games, and a custom-designed ping pong table. The introduction of large-scale graphics, designed by TPG’s in-house graphics department, brought the agency the color and visual interest that they had requested. A custom-designed reception desk with a bold Octagon graphic greets everyone coming in; here the number 8 in red works as the letter “G,” a double entendre on the name. A palette of white, bright red, black, and wood is established at reception, and it is repeated throughout the office. The wall behind reception and its adjacent wall have a swoop of black and a red number 8. The wall includes oversized images of people playing tennis, basketball, ice hockey, or entertaining, speaking, and snowboarding — it is a very energizing graphic. As people move into the space, a shallow seating area, furnished with mid-century modern furniture, backs the smallest of three conference rooms, all of which have glass walls so that meetings and conferences are all very visible. Moving through the conference rooms, the designers added more graphics in the form of a bright red wall outside of the largest conference room, which is the backdrop for a grid of Octagon’s client photos and constantly changing images. 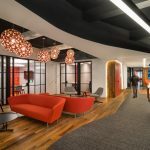 Largely defined by informal seating including a semi-circular red couch, this is the virtual center of the office, where people gather to socialize and work. Staff can eat at a high bar with stools, or at more traditional banquettes with tables and chairs. The designers added many options for playing, dining, and hanging out, which is the purpose of the space. TPG’s design is sustainable in its re-use of some existing materials, especially the black-and-white marble floors; existing walls, almost none of which were demolished; and new-old reclaimed wood that is used on some of the floors that were replaced. While the imagery, clients, and personnel may change over time, the Octagon’s offices will be appropriate and fresh for many years to come, and — at the same time — will convey the thrill of sports and entertainment marketing to everyone who visits the space.